New Delhi, August 23, 2016: Winning medals in Olympics is not just about sports it affects the collective spirit of the Nation. India won just one silver and one bronze medal in the Rio Olympics that concluded today but the whole nation cheered. Beyond the low count of medals that we got the nation cheered the performance of every participant who even got close to winning one. The aspirations of the nation are high in all areas we have the youngest population of any country and the pride of a nation is built on performance in mega sporting events like Olympics. Our poor performance is already being analysed by critics and experts but the root cause is not being addressed. 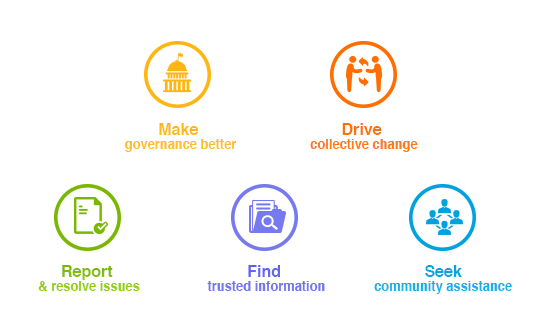 Therefore, LocalCircles did a study on the problems that we face in improving our status as a sporting nation. Olympic level sports players are not developed overnight, it is a continuous process and requires time and effort. Sports bodies are expected to identify the right talent, at the right age, support and train them to Olympic level. Unfortunately, our sports bodies are not able to do this with the same rigour, barring a few exceptions like badminton. The reason is that most sporting bodies are led by non-sportsmen and bureaucrats who have never played at international levels. The politicisation of Indian sports is the root cause for the country not being able to create world class athletes. People are also tired of the political interference in sports. Therefore the obvious question is to revamp the sports bodies in various disciplines in the country. Inducting world class sportsmen at all levels in a sports organisation, so that they can help build a culture that promotes, trains and build world class talent. An overwhelming majority of 86 % people said in the poll that sports bodies should be headed and controlled by sportspersons. This clearly shows that India wants that to prepare for the next Olympics we should begin with restructuring our sports bodies. Corruption was another issue that is endemic in sports bodies due to political interference, nepotism and lack of performance measures. A poor performance in the Olympics does not lead to any action against existing staff due to nepotism. 92 % of the citizen’s perception is that corruption is very high in State sports department and bodies. This perception may also be the reason that most people do not see sports as a worthwhile option for their children. 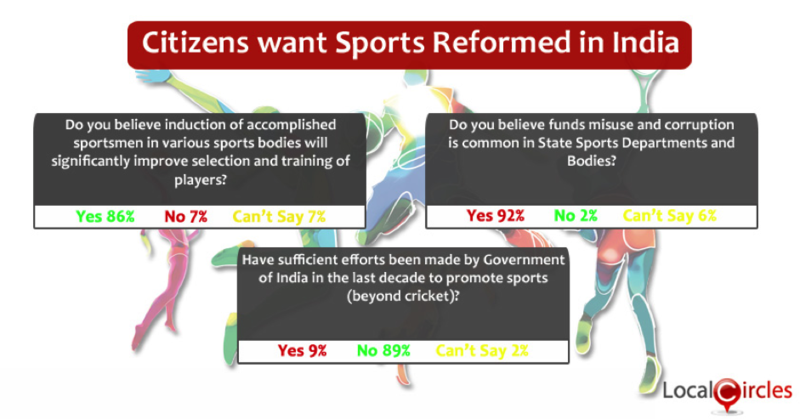 89 % of the citizens also feel that the government has not done much to make sports other than cricket popular in the country. This perception also fuels the charge that the government does not make enough efforts in promoting performance and merit in sports per-se. Please see the polls below and the crowdsourced inputs from the citizens below. 23. All government schools should have good coaches for various sports like tennis, badminton hockey, kabaddi, football etc. 33. Sports Ministry should financially support holding of more and more international events in India in as many disciplines of sports as possible.